This historical novel takes place during the rise of cosmopolitan Manila in the 70s. Buildings towered over paved roads, vehicles caused traffic jams, business districts were expanding, and the music and arts scene was a burgeoning form of entertainment and a stark representation of the country’s national identity. Raised by a single mother in the province, guitar virtuoso Alejandro Sebastian is thrust into the classical music scene when he gets accepted into The Conservatory of Music. With the National Music Competitions for Young Artists (NAMCYA) a few months away, eccentric maestro Pablo Rocca trains his gifted protégé to become a guitar grandmaster while Dani, a free-spirited violinist, provides friendship and inspiration. From Manila’s highbrow venues to its darkest corners, Alejandro’s musical journey will change all he has known and all he has ever wanted to become. 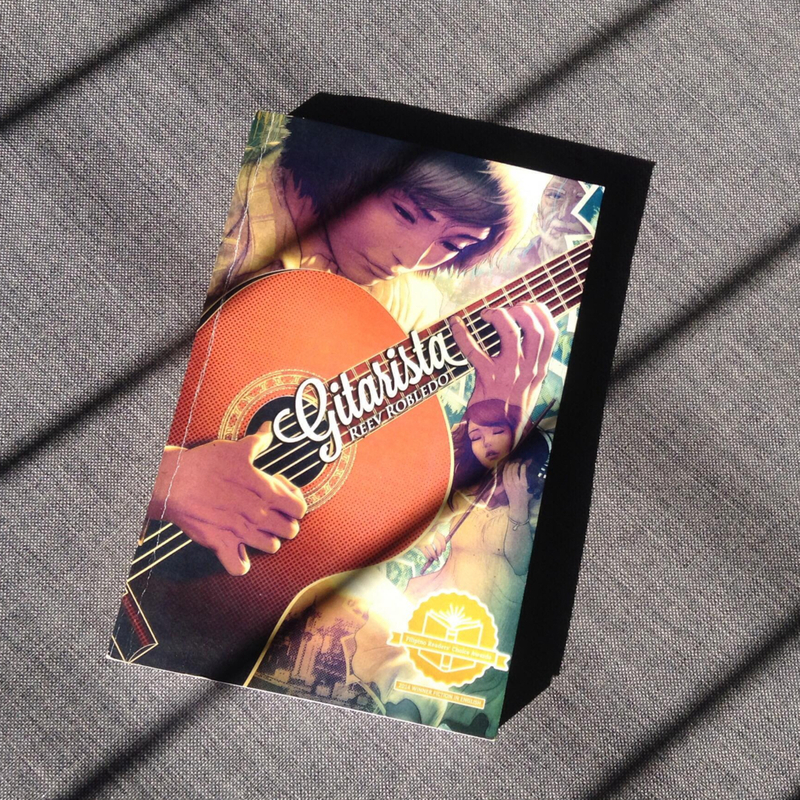 A bittersweet romance between truth and destiny, Gitarista is a young man’s search for the symphony of his life. Having grown up in the ’90s, most things I know of the ’70s are either from history classes or through word-of-mouth, so it was a treat that a coming-of-age story such as this one would bring me back to that time. At first, it was a little challenging to get into, as I tend to shy away from music-themed and third-person POV stories, but the storytelling was so compelling and how music was described was just so beautiful that it made the pages fly by. I was impressed by how this story of self-discovery was able to intertwine the political and cultural climate at the time and told it to me in a way that I could relate to on more than one level. Let me start with Alejandro’s first step in university. Given the descriptions, I believe I may have gone to the same campus that he did, and that took me back to my own college years. Now, unlike guitar genius Alejandro, I was no music major, but I understood a lot of what he was going through. These were such universal longings: wanting to belong, to find one’s place, to prove’s one self. All of those were difficult enough to deal with alone, especially that he already had family issues to begin with and that he was not Manila-bred (no shade at all; just stating a factor in adjustment), so I liked that he had people who could help him realize his worth. I thought Dani, an adventurous anthropology student (who I thought had a little bit of an MDPG complex) that eventually became his friend and love interest, and Maestro Rocca, the professor mentor who reminded me of Professor Moody from Harry Potter and later had a bigger role to play, were great additions. Following through Alejandro’s musical journey, there was a pretty strong focus on how much he associated himself with guitar-playing, and I loved that. I have an idea of what it feels like to have a kind of passion, and how it feels to put that passion in some sort of pedestal, such as it being “the answer,” or at least “a direction.” So when it was taken away from him (quite literally, at that, and scarily) once or twice, it was as if he almost didn’t know which way to go anymore. Those turns made for very interesting turnarounds and reveals as the story neared the end. And speaking of reveals, may I just say that there were so much to unpack? I know this is the fourth paragraph, but truth be told, I might have glossed over some details, such as Alejandro’s overprotective mother, his missing dad, his estranged grandparents, his guitar practices, his gig adventures. All these, I am happy to report, were there for good reason, and all conflicts and mysteries were resolved. I didn’t feel like any of these elements weren’t important because when I closed the book later on, everything made sense. Last, I want to talk about the relevance and timeliness packed in the story. I imagine a lot of research and reflection was poured into this, and I commend the author for braving this huge and ambitious story line. I’ve mentioned how I wasn’t born at the same time of the setting, but the thing is, most things that happened in the book are still around today. (Note also that this book was published in 2013.) The political scandals, the social and economical poverty, the brokenness—these continue to prevail, just in different forms and people. It’s both heartbreaking and fascinating how it was able to capture the concept of repeated history. I just hope that, like Alejandro was able to eventually, find the answers to his questions and came out as a victor (well, except for that one frustrating farewell letter from a certain somebody as he flew to Madrid to play as guitar grandmaster), we would too—and hopefully, soon enough. Bookbed received a copy from the author in exchange for honest thoughts. Read our Review Policy here.